Greetings to all you Windows Insiders from the Snip & Sketch team! We recently released another version of the Snip & Sketch app–a handy tool that’s built into Windows to make it easier to take, edit and share screenshots. This latest version provides even better performance and builds on a long list of other updates that we have built into the app over the past 6 months. Many of these updates were inspired by brilliant feedback from our Insider community. We wanted to give you an Insiders’ look at how we leveraged that feedback–and how it’s inspiring future development. Being able to take screenshots or ‘snips’ of your screen has been a part of Windows since we introduced the Snipping Tool back in 2002–and with good reason: sometimes, taking a screenshot is the easiest and most effective way to capture an idea, explain an issue or communicate just about anything on your PC. Fast forward to May 2018. With millions of people using the tool, we decided it was time for an update. 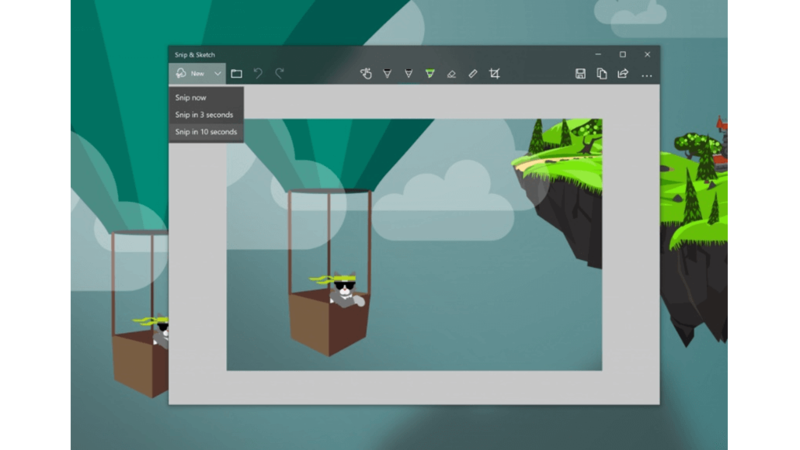 So, we made the leap to a more modern snipping experience with the introduction of a new Snip & Sketch app to Windows Insiders with Insider build 17661. A lot of the app’s functionality was originally introduced as part of the Windows Ink Workspace. As a standalone app, Snip & Sketch offered even more benefits over the original, full-screen experience. For example, because you can now switch between Snip & Sketch and other apps, multi-tasking has become much easier. The new app also gave us the ability to update it directly (and therefore more frequently) through the Microsoft Store, without having to wait for the next Windows release to introduce new updates. That option was to become especially valuable in the coming months as Insiders provided an amazing number of insights and suggestions for how we could make the app even better. As Insiders played around with the first version of the app, two suggestions in the Feedback Hub quickly made it to the top of the list: one was to delay capture of your snip so you had time to open, set up and capture items like pop-menus. The other was to be able to take a snip of a specific window open on your screen. First, we delivered our delay Snip Feature. (Just click the chevron next to the New button in the app and you’ll now find options to “Snip now”, “Snip in 3 seconds”, and “Snip in 10 seconds”.) Then we followed up a few months later in 19H1 Insider Preview builds with Windows Snip. Along the way, Insiders also suggested that we make it easier to print screenshots. We tackled that request, too–and now you can print directly from the app. We also heard your feedback about expanding file support and screenshots can now be saved .as jpg and .gif files (as well as .png files). Yet another interesting suggestion which we added: an option to copy updates made to your snip so they appear automatically on your clipboard. As we have begun development for the next release cycle, we have concentrated on fine tuning performance of the app. Once again, Insider feedback has also played a big role in helping us identify and prioritize key issues. For Insiders in Skip Ahead, you might have already noticed these improvements with our latest version of Snip & Sketch in Insider Preview build 18850. For example, we added a fix to correct an issue where some snips were blurry when saved to the clipboard. We made sure that pictures library is the default location for snips you save. And we’ve updated the default save format to be .png (another great suggestion from an Insider). As we look to the future, we’ve got other top Insiders requests on the drawing board, including: new typing and shape annotation tools, a zoom feature, and more help for discovering the powerful snipping keyboard shortcuts. It’s still a bit early to confirm exactly which features will make it into the future builds. But one thing is for sure: Insider feedback will continue to play a big role in helping make Snip & Sketch even better as we move into 19H2 and beyond. Please keep sending feedback and upvote existing requests in the Feedback Hub–your input really helps us prioritize and make a case for further investments in Snip & Sketch. To check out Insider feedback (and provide your own), go here in the Feedback Hub. To learn more about Snip & Sketch, check out this Windows Community in-depth video.